Tablets and smartphones continue to influence local search and consumer buying habits, but social networks, mobile apps and daily deals have become the go-to source for finding information about nearby businesses, according to a new survey. Some 49% of mobile and tablet users use apps for local business searches, and 64% of tablet owners search for local stores on the device at least weekly, with 86% making a purchase from their most recent search. 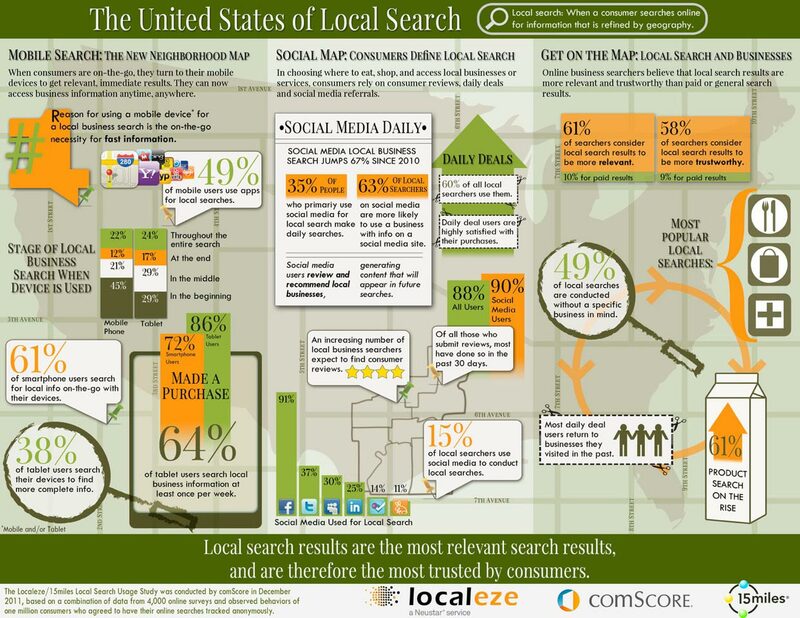 In addition, 61% of smartphone users conduct local searches from the device, according to the Localeze and 15miles Fifth Annual Local Search Usage Study conducted by comScore. Local search has always been fragmented across search engines, but it has become "uber" fragmented because of the many more devices and applications, said David Dague, vice president of marketing at Localeze. The name, address and phone number -- the anchor identity for the business -- must be consistent across search engines because they share information. If it's not consistent, the search engine receiving the information from the other cannot match information and ads, Dague explains. Think of the business listings as an extension of a print and online campaign. Consistency matters. The study proves that local businesses need to pay more attention to the information in local profiles, not only on search engines and mapping apps, but social networks and sites like Pinterest, Facebook, Google+ and Twitter. 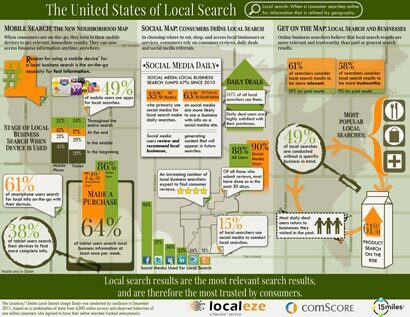 In fact, the study reveals a 67% increase in social network local business searches since 2010. About 35% of those who primarily use social networking sites for local search do so daily, while 45% of social local business users submit reviews online for local business, according to observed behavior of 1 million consumers who agreed to have their online searches tracked anonymously in December. Search marketers have continually stressed the importance of updating business profiles on Google, Bing and Yahoo map programs, along with social sites. Ironically, 61% of online searchers consider local search results more relevant versus 10% for paid-search ads. Fifty-eight percent trust local search results more, vs. 9% for paid ads. The highest percent goes to social networks, with 63% more likely to use the information about the local business when available. When it comes to local businesses connecting with local residents, daily deals appeal to consumers. For coupons offering local products or services, 60% of survey respondents use daily deals, 88% named Groupon and 86% named Living Social as preferred services, and 86% said they have or plan to purchase future deals. 2 comments about "Mobile Apps, Social Sites Are Key Search Tools For Local Business". Lon Bason from Harper House, February 29, 2012 at 2:53 p.m.
Why place a mobile ad that might reach a mobile consumer when you can place your Ad and Action Code in the hand of Actively Mobile Consumers via the Mar-Key CardBook? The CardBook is like a printed "App" for anyone carrying a Smart phone or device...reaching as many as 500 million adults per year who spend $2 Billion PER DAY related to their travel activities. Jason Phillips from Local SMB Search, March 1, 2012 at 12:18 a.m. Awesome chart and excellent article. Dague is spot on about accuracy and local fragmentation. Not every business is going to need/want social media but it's undoubtedly an exploding vehicle for local search . The solution may be location based mobile advertising, both display and search along with address standardization/directory syndication, Places page included.